We encourage any interested author to submit their fleshed out ideas that fall into our topics of interest to this special issue on QoE-centric Analysis and Management of Communications Networks. A PDF version of this call for papers is also available. July 15, 2018 (hard deadline). In addition to the Open Call we are also cooperating with the Second International Workshop on Quality of Experience Management (co-located with QoMEX 2018). Outstanding and topical papers submitted to the workshop will be considered for inclusion in this special issue. Select authors will be explicitly invited to produce an extended version of their work conforming to the submission guidelines. As a final opportunity we are additionally cooperating with the 23rd Packet Video Workshop 2018 (co-located with ACM MMSys'18). Outstanding and topical papers submitted to the workshop will be considered for inclusion in this special issue. Select authors will be explicitly invited to produce an extended version of their work conforming to the submission guidelines. In recent years, the heterogeneity and variability of Internet applications – both in multimedial as well as in interactive environments - has increased significantly. Nowadays, video streaming is responsible for a large portion of all traffic in the Internet, and Internet telephony and video conferencing systems have become part of our daily life. At the same time, the Internet of Things strives to surpass any previous expectations towards the number of devices, and smartphones and tablets contribute to the ever-growing demands on the networks. Furthermore, the proliferation of all types of media hubs also increases the acceptance and development of video games, upcoming virtual reality applications, 360° video and much more. On the technical side, this leads to new paths in the direction of analytics, big data, and automated machine learning techniques. Today, partaking in data evaluations in the direction of Quality of Experience touches at least one of these topics, since the endless mass of data, resulting from the cheap and almost unlimited data storage, must be processed and evaluated. In the era of big data and dynamic networks, Quality of Experience is still looking for its place, and good solutions are in high demand. This Special Issue addresses the latest advances and challenges in analysis, design, modeling, measurement, and performance evaluation of Quality of Experience and Quality of Experience-oriented metrics. Authors are invited to submit articles, which fall within the areas mentioned above or are related to them. Authors should submit their papers in PDF format only to ScholarOne Manuscripts. Paper submissions should not exceed 20 pages. Both author instructions and the respective LaTeX template are available online. All submissions will be peer-reviewed. In case of acceptance, the final and camera-ready version has to take into account comments of reviewers and needs to follow the template's requirements. Submissions will be judged based on their originality, novelty, and quality. Submissions must not substantially overlap with papers that have been previously published or are currently submitted for publication. The submission must be clearly written and in excellent English. All received submissions within the scope of the issue will be sent out for peer review by three experts in the field and will be evaluated with respect to the relevance to this special issue, level of innovation, depth of contribution, and quality of presentation. 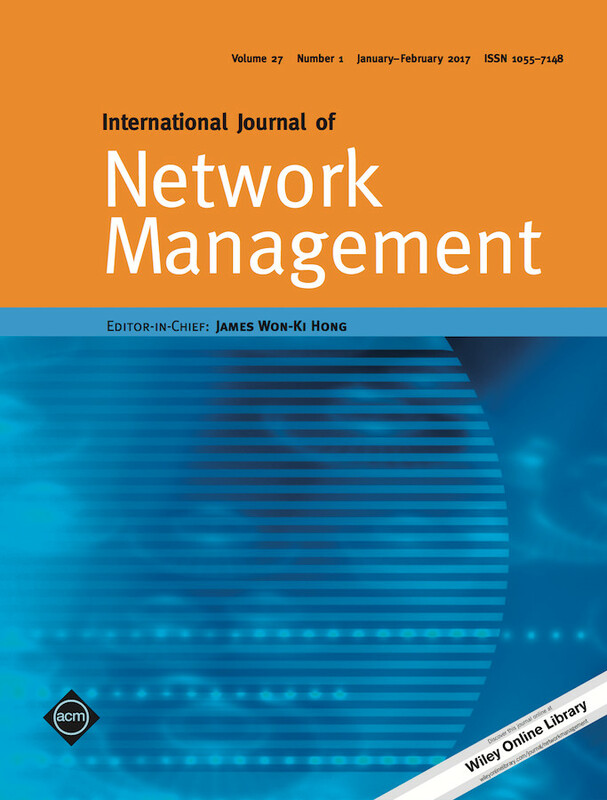 More information about the journal can be found at International Journal of Network Management.